Like Antarctica, the Himalayas and the Moon, the Grand Canyon is one of those places that every geologist dreams they will get the chance to see in the flesh. The expedition in Operation Grand Canyon With Dan Snow gave me that opportunity in a small wooden boat! With little rapids experience, but a hunger for adventure, this seemed a small price to pay to see one of the geological wonders of the world. The canyon, and the expedition, did not disappoint. You get a whole load of rock and a whole load of time to get your teeth into. When I say time, I mean geological time. Riding the Grand Canyon is like taking a time machine back through 2 billion years of the Earth’s history. Most people only get to see this from the rim, or to hike down a small part of it. We were given the opportunity to take it all in, piece by piece, as the boats floated, bounced and forged their way down the river. During the trip I kept some scribblings of the journey as we went down, a way to keep track of all the chaos that was going on. August 10th – Set off day - Badger and Soap rapids! Today we test the boats properly and set off for good. There is much riding of the waves, frantic rowing and adrenalin, cutting through the ice cold water. Within a few seconds we are into the middle, and some more seconds we are out of the line of fire. I was in a boat with Dan Snow and Tom O’Hara, our river expert who steered us down the river. With Dan’s rowing history I was going to have to work hard to keep up. The strangest thing is that as a rower, you enter the rapids backwards. All I could hear was the increasing roar of the water and felt the final drop as we went in then... Bedlam! As the expedition ventured further into this geological wilderness, armed with my notebook and camera, I snapped and scribbled like I was measuring up the canyon for a new suit. “Stop taking pictures of rocks and get rowing!” Constant jibes that I had to fend off while I explained the sheer geological wonders we were passing. August 12th - What a sight, Nankoweap, this is the most amazing 360-degree view of the canyon I could imagine. It takes your breath away with the setting sun casting shadows and a red glow to some of the canyon walls. The journey was going to be a long one, over some 270 miles, and it was likely to be a war of attrition. The most amazing thing was how different the parts of the canyon were, and also how different each of the rapids seemed. August 16th - Fred Thevenin makes a good call and we set of early to hike up a granite canyon (Monument Creek), while the crew rig the shoot for Granite Rapid... Again at Hermit Rapid we plan for a hike up the side canyon (Hermit Creek). We follow an old miners trail (made by Louis Boucher, an old prospector and canyon guide) up through the schists (metamorphic rocks) and make The Great Unconformity. A fantastic peneplain surface with ~1 billion years of time missing. The great unconformity is a surface of ancient deformed metamorphic rocks, buried under giant mountain ranges, that have eroded to the surface and are now in direct contact with sedimentary beach deposits from much younger seas. A massive time gap in the Earth’s history, which you can literally touch with your own hands. It was these side diversions from the river, the opportunities to explore, and the chance to get away from it all that really gave me my geology fix! It was great for me to follow in the footsteps of some of the pioneering geologists of the American continent (John Wesley Powell who lead the original expedition in 1869 went on to be director of the US Geological Survey). Becoming one of very few men on the planet to have survived the Grand Canyon in a boat you would normally be rowing across a lake with a picnic in the country side, for me is also a major achievement and I have the oars in my garage to prove it! Dougal Jerram is a geologist and one of the presenters in Operation Grand Canyon With Dan Snow. 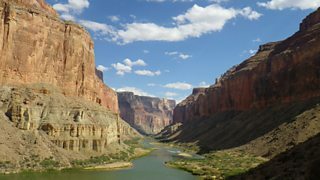 Operation Grand Canyon With Dan Snow is on Sunday, 5 January at 9pm on BBC Two and BBC Two HD. For further programme times please see the episode guide. Comments made by writers on the BBC TV blog are their own opinions and not necessarily those of the BBC.